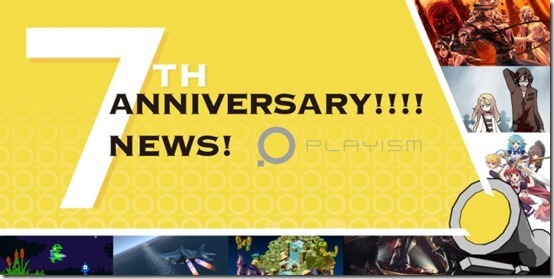 PLAYISM is proud to celebrate their 7th Anniversary this March! To celebrate this exciting month, we are announcing 7 pieces of exciting news! This Summer 2018, the doors to this supreme Metroidvania will be opening! LA-MULANA 2, which was supported on Kickstarter by 5200 people in 2014, will finally be releasing on Steam / Playism. Copyright by ASTERIZM CO., LTD. Game Production Division NIGORO. Licensed to and published by Active Gaming Media Inc.
"Help me get outta here, and I'll kill you." The ultra-popular Japanese Horror RPG Angels of Death, which is slated for an anime this summer, shall also be releasing on the Nintendo Switch. Aboard a luxurious cruise liner without escape, a horrific nightmare begins. The popular horror game NightCry heads towards its release on PSVita. Let’s explore a lively voxel garden filled with monsters! This Action RPG game, developed in HSP Program, is getting a major power-up from the original Japanese Hakoniwa Explorer and releasing on Steam / Playism. Vertical Strike Endless Challenge, a flight-based action game designed to be easy to pick up and enjoy right away, and be playable over short timeframes is now heading towards a Nintendo Switch release. C&F Inc. teleporters are going offline all over the place, and it's up to an intrepid frog employee to fix the situation. Kero Blaster is coming to the Nintendo Switch this Summer 2018! Wielding magic blades, four girls fight back successive waves of monsters in this exhilarating hack-and-slash action game, coming this Summer 2018 to the Nintendo Switch.